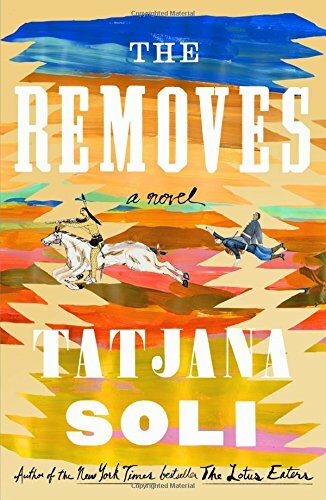 Tatjana Soli Talks About Her New Novel, "The Removes"
"I'm always interested in people who are living an ordinary life one day, and the next it all falls apart," says Tatjana Soli. This bestselling author of The Lotus Eaters, The Forgetting Tree, and The Last Good Paradise has created two such protagonists in her acclaimed new novel, The Removes. One of these is Libbie, based on Elizabeth Bacon, the privileged daughter of a Michigan judge who in 1864 married George Custer -- later General Custer of the Battle of Little Bighorn -- and accompanied him to remote and sometimes dangerous posts in the Dakotas, Texas, and Kansas. The other is Anne Cummins, an entirely fictional white teenager taken captive by the Cheyenne after an attack on her family’s homestead in Kansas. Anne must struggle to assimilate into a totally unknown culture, and to survive despite brutally harsh conditions. Speaking to the Amazon Book Review by phone from Monterey, California, Soli described the original captivity narratives that led her to write Anne's story, the writers who've inspired her work, and her research into Libbie's passionate, complicated marriage and her dramatic experiences on the American frontier. Sarah Harrison Smith: What inspired you to begin writing The Removes? Tatjana Soli: The first inspiration for the book came when I was reading American military history. When I was doing my Vietnam research for The Lotus Eaters, I had read a lot about the 7th Cavalry. Then I started to read about Custer, and I thought, “This is such an amazing time period.” I love research. When I started to read captivity narratives, especially the ones by Mary Rowlandson and Fanny Kelly, I knew I had the heart of the book. These girls were taken by various warring Native American tribes, and their stories of survival were amazing. I've always been attracted to stories of people experiencing radical change in their lives and how they deal with that. It strips everything else away and tells us what it is to be human. One of my mentors was the great Robert Stone. His biographer told me recently that Stone also was fascinated by the Rowlandson narrative. He wanted to use it somehow in a novel but he never got a chance. The captivity narratives are a unique type of history that show cultures clashing on the level of the individual. In this case, the most helpless members of society. But these women were anything but helpless. They were fierce. So many possibilities interested me in writing about the West from a different perspective that I just dove in. Tell us about the title, The Removes. In the Mary Rowlandson narrative, she has each section numbered “Remove.” A “remove" refers to moving her physical location farther and farther from her home, from the life she had known. It’s a Biblical metaphor. It sounded mysterious and also works as a metaphor for all the characters in my book. It’s very much what the book is about. It’s an existential thing: how do we endure losing things in our lives? How do we rebuild? You have two protagonists in The Removes. One is Libbie, based on Elizabeth Bacon, who married George Custer, the Army captain went on to become the general infamous for his role at the Battle of Little Bighorn. What interested you about Libbie's life story? Usually when I approach a novel, it’s the time period and place that is the primary thing. I think taking the two women from different levels of society gives us a broader idea of what life was like on the frontier. Libby has a middle-class life more of us can relate to. As a young woman, she wanted something else than matrimony in a small Michigan town, but there were few choices open to women. Then she meets Custer. He was glamorous, adventurous, and a national hero. She chose that life with all its unknowns. She didn't have the rough pioneering background to know how to survive. I read that she never even learned how to cook, she always had a maid and a cook even though they lived in a tent most of the time. No matter how difficult the life, she stayed with Custer till his death at Little Bighorn. Even after his death, she didn't go back to her hometown, but went to New York. She needed money and got a job, never remarrying. That was very unusual during that time. They were only married for 12 years, but she built his reputation for the next 50, writing memoirs about their lives. She made his legend her career. Your other protagonist is Anne Cummins, who is taken captive by the Cheyenne after an attack on her family’s homestead in Kansas. Is Anne based on a real person? Anne is a totally fictional character. She's a composite of the women I read about. After Rowlandson and Kelly, the later captivity narratives get much more complicated, and I wanted that complexity in her story. Cynthia Ann Parker was another inspiration for Anne because after 24 years living with the Comanche, when the Texas Rangers brought Parker back to her [white] family, she was despondent. She tried to escape and they wouldn’t let her. In captivity, Parker had three children. Her two boys got left with the tribe, but her baby daughter was with her when she was taken by the Rangers. While she was with her white family, her daughter passed away and Cynthia died a year later, basically of a broken heart. I didn't want to make Anne's story unrealistic. She assimilates to Native American culture to a certain extent. She is unable to feel normal to her white culture by the time she is returned to it. Families torn apart, dislocation, these are timeless themes. I showed the manuscript to the historian Peter Cozzens to get his feedback and make sure it was historically accurate. Peter and I discussed how in the earlier captivity narratives the Indians were portrayed as without redeeming features. There had been little contact between the cultures other than warfare at that point. Later narratives were much more revealing of the humanity of the Native American cultures because by then there had been more interaction. The Plains Indians were warrior cultures and they used violence to get the settlers to leave their land. The U.S. Army used cruel tactics to enforce unfair treaties. I really tried to show how brutal the conflict was on both sides. Was it tricky to find the right balance in describing Anne’s experience as a captive? She is assaulted and treated very badly. I scaled it back compared to accounts I had read. I left just enough to portray accurately what would have happened. The stakes for her are clear. We have a sense of what her existence was like. How does the experience of your two protagonists, Anne and Libbie, relate to your own? I’m an immigrant. I came here at 5 years old. I always look at outsiders, the vulnerable, and clashes of culture. The current intolerance for immigrants is very painful to me. I’m always interested in people who are living an ordinary life one day, and the next it all falls apart. War lends itself to that. What books did you use for your historical research? I read almost all the Custer books. The Evan S. Connell book, Son of Morning Star: Custer and the Little Bighorn, was the most influential in terms of the character of Custer and the people surrounding him. I also read Peter Cozzen’s book, The Earth is Weeping: The Epic Story of the Indian Wars for the American West, and My Life on the Plains, or Personal Experiences with Indians, by Custer, and the three books that Libbie wrote, Following the Guirdon, Boots and Saddles and Tenting on the Plains. Libbie and Custer did the positive spin, they did not ever get into the dark parts of their experiences and you immediately wonder what was really happening. They always made it lighthearted -- these are not very serious books -- but they understood the politics of living on the frontier and they wrote them mostly as entertainments. Custer is such an unpopular person to write about. I thought, “Can I do this? Who is going to want to read about him?” But he’s fascinating, because he’s such a painted-black character in history. Some Native Americans who fought against him praised him as a brave warrior. Indian scouts who worked for him loved him. There were better men than him in the army, but there were also certainly worse ones. I have a hundred pages of a new book that I haven't had a chance to look at for half a year. I thought The Removes was going to be a quick book, but it's been a few years. That seems to be the rhythm. I’m always hoping to write a short novel and I haven’t made it to that yet. They grow and they grow. This new book is set during the Iraq War, and it’s about a soldier. Robert Stone was one of my most important mentors. I read his books for inspiration. I came to him as a reader before I ever started writing seriously. It sounds corny, but I read books because they are cathartic and help me become a more empathetic human. I don’t think of books as entertainment. I want to read difficult books that transform you. That’s what I find so appealing in Stone’s work. I also love Tim O’Brien’s books. I was lucky enough to study with him in college and he was very influential to me. Marilynne Robinson amazes me. I torture all my students with her first novel, my favorite, Housekeeping. I am in awe of pretty much any sentence Joy Williams has ever written. Thank you so much, Tatjana Soli.